Several students and blog followers asked me to do a video tutorial on cloning in Painter 12. Cloning isn’t a simple subject. But before I get started, don’t forget that Holiday Open Studio starts Saturday 11/19/2011 at the Digital Art Academy. This is one of the most fun classes at DAA. You can use Painter X, 11 or 12. It is for beginners and experts alike. Please click on this link and check out Open Holiday Studio. Cloning has many options and the results do not have to look photographic; the term creative cloning is alive and well, at least it is on this blog. 🙂 My plan is to do a series of cloned paintings, starting with this one of a cardinal that uses a very simple approach to cloning. How many will be in the series? I don’t know, but at least one more. Each will be a bit more complicated than the previous. In the videos you will see me create this clone of the cardinal. You will see everything I do in about 50 minutes; I decided not to do any speed painting. In the first video I create the background with clone color and very wet watercolor variants. In the second video I begin to clone paint the subject. As usually happens, I messed up stuff in the third video. I decided to leave it and show you how I fixed my problems. The final video completes the image; I hope you like it. Well, that is it. What do you think? “Aha! You lie. You don’t believe what you said.” he was almost screaming. “I do believe you are positive and upbeat all the time. I am glad that you are, too. I am in the market for a new computer, and when I buy it, I will retire this computer. How about that. I’ll plan a retirement party,” I tried not to chuckle. Well folks, that’s all I have today. I hope you enjoy the videos. This entry was posted in Skip Allen & Painter 12 and tagged Cloning in Corel Painter 12, Cloning watercolor in Corel Painter 12, Corel Painter 12 Class, Corel Painter 12 Tutorial Video, Digital Art Academy, Skip Allen and Painter 12, Watercolor. Bookmark the permalink. Skip awesome stuff. I can’t wait to try this out. I like the very loose effect you achieved, the image doesn’t feel like a clone at all. Interesting when you have the photo and the final image side by side in the last frame, you can really see how distinct they are. I noticed the setting you have for the dry Fill1, which you seem to use a lot and I think I will try your wooly brush for the RWC-2. The under painting or canvas treatment in the beginning really sets the stage for the subsequent effects. It sort of pulls the painting far apart from the source photo, nice effect. Anyways I will make some time this weekend to test this out, thanks for posting. Tweaking brushes on the fly is crucial to painting, I think. I could spend days looking for the perfect brush, or a few minutes tweaking the brush at hand. And, I seem to always need something I don’t have. I didn’t add a very dry fill brush to Cool Springs and should have. But, I’ll fix that in another set and provide the papers, too. Can’t wait to see what you do with this technique. The clone background was a happy accident. I was trying to figure out how to do a cloned background and using the wet brushes with some wild textures seemed to fit the bill. This was absolutely fascinating! Thanks for taking the time to do these videos, I get so much out of them. And you are welcome. I am glad you enjoyed the videos. I enjoy making them. Skip, this is truly creative cloning. I love it. I so envy you some of your picture taking opportunities. 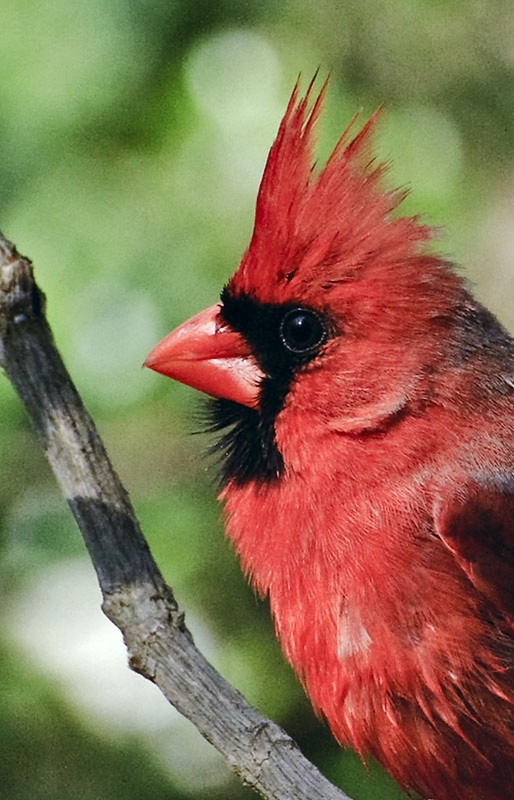 I adore cardinals, so what do I get in my yard? Burrowing owls, egrets, Muscovy ducks, and white ibis…’taint fair…LOL. Thank you so much. I know you don’t like clones, which makes your comment special. I really appreciate it. There are cardinals in Florida, right? I wouldn’t have them around my yard, either, but I put out tons of seed all year. I even get them nesting all around the house and then have the joy of watching them feed their young. Both male and female feed the babies. Since you teach, too, you understand the number of hours we spend at the computer. For me, a grackle coming to the feeder is a big event. LOL. I can only second what the others have been saying – these vids are so wonderful and you are as usual so very kind sharing your approach & resources freely. I´m gonna have a try at this right now even though I don´t have all the brushes you use. This is so exciting!!! Thank you so much…. I am working on the brush set right now. I hope to have it out today as well as the paper library. I realized after posting the video that it wasn’t fair to use brushes that were not available…even though I show you their settings. If I don’t get finished today…then I’m sure I will have them tomorrow. Stay tuned. In the meantime, I hope you have fun with the concepts. I LOVE IT! ESPECIALLY THE RE-PORE YOU HAVE WITH KEVIN. LOOKING FORWARD TO THE VIDEOS. Let me get the brushes and papers posted and then I’ll do another video. I loved these videos. Especially the fact that your cardinal doesn’t look like a clone. Something I want to achieve. Bravo! It is fun cloning…Karen Bonaker always says…don’t be a slave to the reference. That about sums it up. Thank you for sharing this videos with us Skip. The final painting looks just like a holiday greeting card. I hadn’t thought of using it as a card, but it could be used even for thank you notes. Wow Skip, I didn’t know cloning could be so “unlike’ a photo! Very creative and watercoloury looking. Well done my friend! Thanks for al the time you spend teaching us and making brushes and papers. Hope you had a wonderful birthday! Skip:Thank you so much for the wonderful videos of painting your beautiful cardinal.Can’t wait to try it. I think it is an exceptional painting and just want to thank you for all you do for us at Painter Talk, here, and DAA. You are just the best. I remember when I started working with Painter, it was the folks at DAA and Painter Talk that helped me develop. I’m just paying back. Thanks for stopping by. I have lots of friends in the UK. Everything I do is on line, so no problems with travel. 🙂 There is a wonderful site that I love that is in the UK. Check out The Artist Quarter. http://www.theartistsquarter.com/ It is the brain child of Tim Shelbourne and a fun place to be. Thank your US digital friend for me. I appreciate the support. Keep coming back or subscribe to get notifications of when I post. So glad to see you stopped by. 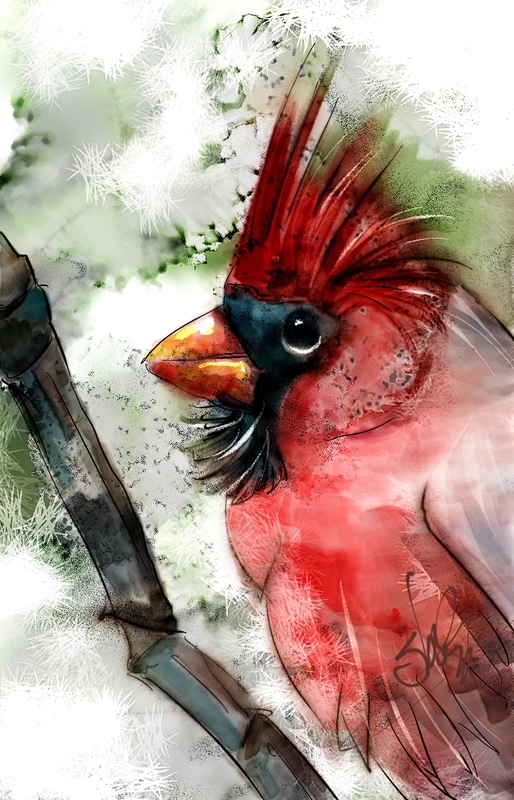 Your Photoshop watercolors are an inspiration and amazing works of art. We are on the same page about cloning. It is just another tool that can be used creatively. It is great fun, too. I just found this post on your blog… Thank you so much for all your information and help with Painter 12!! I know it’s a lot of work, but it’s very much appreciated! I appreciate the comment and the thanks. There is a fair amount of stuff on the blog now. I started it in 2010 as a practice blog while taking a class from LVS on blogging. I really didn’t do anything with it until around March of this year. But now that I am getting the hang of it, I am having a lot of fun. I am trying to follow along with these videos. There are 2 paper textures that you mention in the first video – Joan’s Drip paper and Close Bleed. Is there somewhere when I can get those papers or which ones would do the same in Corel’s default papers. Skip I loved this. But since I am the same age group as you I fell asleep and when I started what I thought was the video I am was on I went to another and all of a sudden two video were going at once. and I was still sleepy. This is a great take on cloning and very helpful to me. I have perused you whole site the last couple of days , did not realize all the videos you have done to help us. Awesome! Actually I was looking for that color library you have on your site, not the watercolor. Cannot think of the name but you said in you Webinar on Saturday, the 2nd June that it was one your site. Very hidden, I have been all over it. I finally figured out Kevin was not an obtuse obnoxive student like me, but someone you made up like Jimmy Stewart had “Harvey” the rabbit. You are old enough to have seen that. You must live in a lovely place as I do in Colorado on acreage. Obviously you do not live in the city and have all that wildlife visiting you. I am one up on you was visited by a BEAR in my pasture and he climbed up the 50′ trees, finally came down and disappeared, I thought, I was filming him all the entire time. I went into my orchard and cornered him about 40′ from me.. and I had thought he was long gone. I just quietly backed up into my yard proper and then into the house. He was a pretty big one too. I am glad you have been reviewing the site. There are a number of videos and stuff… I hope they are useful to some. I do live out from the city in a woodied setting. No bears, yet. Kevin actually started in my very first post when I was taking a class at LVS about blogging. In the first post I was having trouble deciding what to write and I started a conversation with someone or something else. It was a while before Kevin fully emerged and announced that he was a good computer virus. From time to time he shows up and gives me grief and a bit of comic relief for the reader. Thanks for the comment…hope you continue to enjoy the site.